Ocean liners descended from “packet boats”, steamers built to carry mail, which incidentally also carried passengers in the XIXth century. This started with not really passenger-friendly steamers to the classic rival liners that chased the famous “blue ribbond” fast, luxurious leviathans on the conveyed Atlantic line (to New York) in the 1900-1940, and to this day, immense glass and steel floating hotels/theme parks that represent modern cruise industry. Norwegian Epic of the NCL (built in St Nazaire, issue: May 2010 – 330 meters, 153,000 GRT, 14 restaurants, 18 bars and lounges, 7 bridges and 2109 cabins.). There is no doubt that cruise market remains flourishing despite the crisis. The concept was born when the last great transatlantic liners disappeared, victims of the aviation after the war. Yet these great floating palaces, since the beginning of the century had rivaled two chapters: Luxury on board and speed, not to mention their dimensions. The time when the new fortunes of the industry of the first classes lived in a pomp worthy of the European nobility, while the interior’s dephts were crowded by candidates for emigration from all over Europe to the new world. The goal is no longer to travel, but to live on board. The new floating palaces of the 21st century are thus motorized floating cities, neither more nor less. Since the 90s, the date of the explosion of this new market, several companies have established themselves: The very first pioneer of the genre was the NCL (Norwegian Cruise Line), followed by the Royal Carribean Cruise Line (RCCL) of Knut Kloster and Edwin Stephan, two Norwegian shipowners who felt demands for this new market. Their approach to the new ships was radical and will hardly change since the 1970s: While classical Liners were built around an enormous propulsive group capable of exceeding 33 knots, they had several classes, relatively poor in recreational facilities and with a non-negligible load of goods. 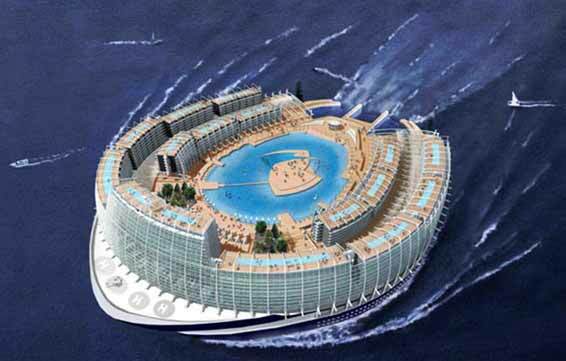 The new cruise liners were to be floating hotels, designed for and around one-class passengers, very rich in leisure facilities, and designed for one-week trips to paradisiacal destinations, with one stopover per day. In 1970, three buildings were built, the Nordic Prince, Song of Norway and Sun Viking, by the Finnish shipyards Värtsilä of Helsinki, the future leader in this field. Other projects, such as Fincantieri, Howaldtswerk in Hamburg, Meyerwerft, Naval Union of Levante in Valence, Saint Nazaire, Papenburg, Vickers-Armstrong and John Barrow, were also solicited for similar projects. Several were indeed based on the success of the two Norwegian owners: The current US leader, the Carnival Cruise Line, Princess Cruises, Costa Cruises, Crystal Cruises, Disney Cruises, Regency Cruises, Celebrity Cruises, Star Cruises, and famous companies such as the Cunard, P & O, Holland America Line, and other mining companies that found new, juicy outlets, even if it entailed a radical overhaul of former liners dating back to the 1950s and 1960s. From these giant companies, they arm four to twelve cruise ships and more, and offer year after year, more and more facilities, cabins, and a debauchery of tinsel according to the American taste, strongly inspired by the delusions of the hotels of Las Vegas. Thus these liners since the 90s, have swelled spectacularly, matching and surpassing in dimensions all liners of yesterday. One can quote for example the Grand Princess of 1997 and her 283 meters for 104 000 GRT to compare with the legendary Norway, ex-France, with her 315 meters and 76 000 GRT. It was during the 1990s and especially 2000s that cruise ships crossed the limit of 300 meters. Due to their unmatched interior layout, life on board even improved due to the ratio between passengers, livable space (cabins of 12-25 m2 on average), recreational areas, and prolific personal. Interiors diversified greatly: From the turn of the century sports fields and swimming pools on the upper decks, restaurants and concert halls were commonplace, but since the 1990s all the eccentricities of modern construction seem to have been reached: Atriums on 5 to 9 levels lined with glass lifts and tropical plants, giant shopping malls sometimes as long as the ship itself, even real streets reconstructed like Broadway on CCL ships. This, added to athletic-size swimming pools for Las-Vegas type watershows, numerous theme restaurants and bars, operas and theaters, open air aquaparks and golfs, rock climbing… There seems to be no limits to the industry’s imagination, in a race to awe in entertainment. 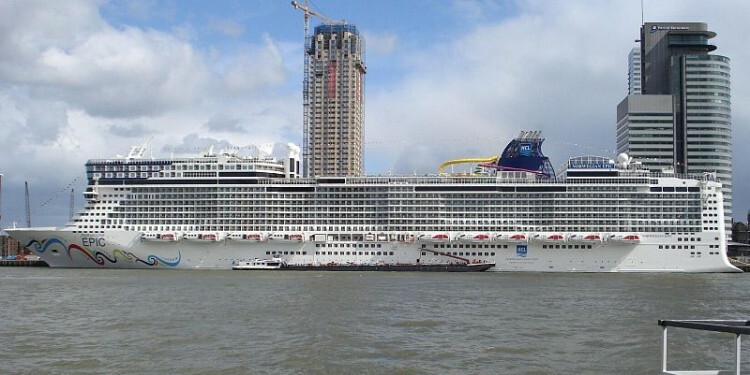 Thus the Oasis and Allure of the Seas, two giants of 380 meters, 220,000 GRT, 16 bridges, 2700 cabins and 5400 passengers, would be the first to offer a central space open on most of the ship, open to the rear. Another, more hypothetical project is the floating island of Alstom Marine designed by architect Jean-philippe Zoppini and 400 meters long, 300 wide, 30 high apartments, an inland marina and 10,000 passengers (below). Or the Princess Kayuga, its 505 meters, 20 bridges and 550,000 GRT, designed to have all the functionality of a self-contained floating city. But the biggest and utopian of all is undoubtedly the Freedom Ship, a kind of floating barge of 1317 meters long by 221 wide, the upper deck serving as an aerodrome and having 18,000 habitable modules for permanent residents. The ship would be a kind of “floating country”, with its own citizenship, which would sail in the offshore zone for years… Like any good utopia, for the time being this project has not found investors.